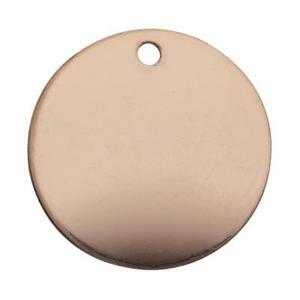 The GFR110 – 14/20 ROSE Gold Filled 13mm 24 gauge Round Blank with a 1mm Inside Diameter Hole. Create a bouquet of Rose gold filled jewelry designs with these tempting blanks. You can stamp or engrave around the outer edge, smack dab in the middle or straight across the length of the blank. To get this beautiful rosy hue – more copper is added to the gold alloy than what is generally used in regular gold filled items. Finish with one of our rose gold filled chains.